All of Walker’s activity took place between Minnetonka Blvd. and Excelsior Blvd. – it did not include Brookside or the North Side. The following are some of the businesses in the Village prior to World War II. Some have links to longer descriptions. The sketches are from the 1892 map used to boost the town. Descriptions of Walker’s businesses come from Norman Thomas’s manuscript on the history of St. Louis Park. Also see a list of businesses that were included in a 1929 directory, albeit with no addresses. The Applequist Ice Business was an essential service in the first years of the 20th Century. The Minnesota Beet Sugar Manufacturing Company was incorporated on May 10, 1897. In 1898 it took over the 36-acre site of the Minneapolis Esterly Harvester Company and changed its name to the Minnesota Sugar Company. Louis Berkowitz had been in the Park since at least 1901. He ran a grocery store where City Hall now stands and then at Salem Ave. and Minnetonka Blvd., where he also had a gas pump. The Minneapolis Box Lumber Co. was incorporated on August 31, 1889. It purchased seven acres of land from O.K. Earle. The company was insolvent by January 16, 1892. Dana and Anne Thompson took over Brookside Grocery just after their marriage in 1915. It was located at 4348 Brookside Ave. Not to be confused with the Brookside Market, which was up on Excelsior Blvd. at Brookside. The Village Council bought groceries from N. Dworsky and Son. The Carbine and Carbon Chemical Corporation was listed in the 1933 directory at Lake and Monitor Streets. Century Foundry made “soil pipe” in 1938 and was a local company. Despite the Depression of 1893, the Minneapolis Chair Company was incorporated on August 30 and lasted until 1923. The company employed 100 men and leased its space from Walker. An 1893 map shows the name Hiram A. Thayer. The company was located south of the Milwaukee Road tracks between Natchez and Princeton. Today that area is 4600 Park Glen (vacant land owned by the County); Belt Line Blvd. ; and 4700 and 4800 Park Glen, which is the Beltline Business Park, built in 1985. The Minneapolis Esterly Harvester Company was incorporated on April 18, 1892. The company manufactured farm implements (featuring a self-tying twine binder). There are pictures of the Fern Hill Store, run by August W. Nyberg, from around 1917-18. 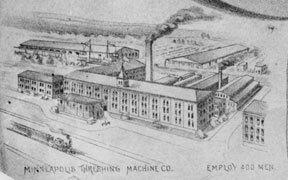 In 1902 the Fosston Wind Stacker Company occupied the building formerly used by the Thompson Wagon Works and manufactured its threshing machines for two years until it moved to St. Paul. Freeland’s Grocery opened at Alabama and Oxford in April 1919. The Minneapolis Jarless Spring Carriage Company was incorporated on July 27, 1891 and employed 100 men. George B. Schoepf of Minneapolis had invented a spring for buggies and wagons, and the company manufactured springs, wagons, buggies, and other vehicles. T.B. Walker installed his son Gilbert as one of the incorporators and financed the factory, a three story rectangular building located in the Industrial Circle, northeast of Lake Street. The company became obsolete as automobiles replaced buggies. The 1898 map shows an unnamed store on Lake Street between Pennsylvania and Oregon. Today that site is part of a house at 7515 Lake Street, built in 1942. Linde Air Products is listed in the 1933 directory at Lake and Monitor Streets, inside the Industrial Circle. It merged with Prest-o-Lite (see below) in 1946. The Lindsay-Greenfield Vehicle Company manufactured wagons and distributed agricultural machinery in 1881. The company was owned by William Lindsay of Milwaukee, T.B. Lindsay of Minneapolis, and E.W. Greenfield of Minneapolis. Lindsay Bros. was one of the largest dealers in wagons and agricultural implements in Milwaukee, and Mr. Greenfield was manager of the vehicle department of the firm in Minneapolis. Greenfield was to have managed the business, and F. P. Wallace, who had been in charge of the Thompson Wagon Co., whose factory they had leased in 1898, was to remain as manager of the factory. The Thompson Wagon Co. burned down in 1898, so it is unclear whether Lindsay-Greenfield found another site or rebuilt on the Thompson site. The database of the Minnesota Historical Society indicates that they have 10 boxes of financial records, correspondence, etc. from that company. Company records seem to run through 1980. In 1891 T.B. Walker provided an L-shaped building in the Industrial Circle northwest of Lake Street for the Minneapolis Malleable Iron Company, again with Gilbert Walker as President. On February 7, 1892, an article announced that the factory was completed and was turning out “first-class Malleable Iron Castings.” Their city office address was listed as 7 to 10 Lumber Exchange. The factory employed 150 men in 1892, but eventually the product became obsolete and poorly made, and the factory closed down in the 1900s. In about 1917 the company’s assets were sold to the Pacific Investment Company, which became a subsidiary of the Barlow Realty Company. Martin Manufacturing made the Martin grain grinder, a high speed mill that operated with a small gasoline engine. The company was located at the present 7400 Highway 7. It operated there from 1902 to 1925. The Monitor Works, one of the first and certainly the most successful industrial endeavors in the early suburb’s history, incorporated on November 9, 1891. Ironically, Monitor was not located inside the Industrial Circle. Industrial directories from 1936 and 1938 list the N.W. Metal Manufacturing Co., which dealt in scrap metal. In the nineteen-teens there appeared to be a number of peddlers, so much so that the Village Council was concerned. Starting in about 1918 we see permits issued, starting with a B. Shine, who was issued a permit to “pack peddle.” Others had a “one-horse rig.” J. Grofkos and T.G. Bennis received permits in 1919, as did Harry Golentos, who had two horses. The fee was $7 for three months, the thought being that they didn’t want the peddlers around for very long. In 1920, L.A. Johnson sought to peddle with a Ford. That year James Chepokas received a free license because he was a veteran. Finally, on December 2, 1920, the Council passed an ordinance that showed just exactly how they felt about the matter: An Ordinance regulating licenses for peddlers, hucksters, circuses or traveling shows.” In 1955, a request to sell fruit door-to-door was denied. Pockrandt Lumber was located at 6325 Highway 7. The Prest-o-lite plant was located at West Lake and Monitor Streets, south of Highway 7, inside the Industrial Circle. Rodgers Hydraulic, Inc. was founded by brothers John L. Rodgers, Sr. and George A. Rodgers in 1929. The company started by making parts for construction tractors. J.K. Seirup sold coal and wood at his location on Highway 7 at Wooddale. This site has been flattened. 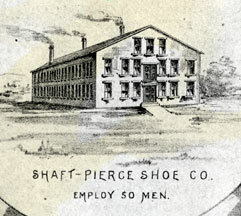 The Shaft-Pierce Shoe Company was incorporated on April 12, 1892 by W.S. Shaft of SLP and Charles S. Pierce of St. Paul. Walker built a 2-1/2 story building in the industrial circle, northeast of Lake Street. The company, which had a cutting and stitching room in Minneapolis, manufactured Minnehaha Shoes. In 1892 it employed 50 men. Functions were consolidated and moved out of St. Louis Park in 1901. 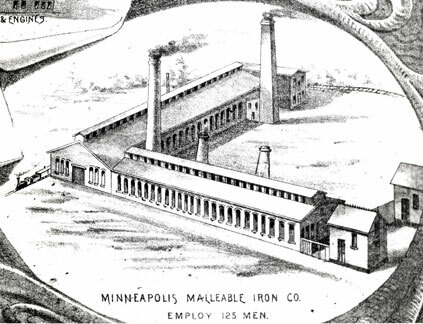 The Minneapolis Specialty Manufacturing Company manufactured iron and wood products, employing 50 men. It incorporated on October 1, 1893. It was located south of Walker Street, straight south from Nevada. It was not in the Industrial Circle nor on future Creosote Plant property. It is now part of 7400 Highway 7, built in 1985. The Swenson and Redeeen Grocery Store and Meat Market was on Walker Street. The 1892 map shows Minneapolis Threshing Machine, which employed 400 men. The 1892 sketches show the Minneapolis and St. Louis Reduction Works, although little is known about it. It is noted that it employed 100 men. 1936 and 1938 industrial directories list the Unexcelled Manufacturing Co., which produced wholesale fireworks. Its main office was in New York City. The Wallis Buggy Company (later Coach and Carriage Works), employed 100 men in 1892, but moved to Minneapolis within a few years to manufacture automobile upholstery. 1936 and 1938 directories list the Wheeler Lumber, Bridge and Supply Co., which operated a lumber warehouse. It was a local company. Many of the companies that were started with such enthusiasm in 1890-92 were wiped away by the Financial Panic of 1893. Fire seemed to take quite a few factories. And other companies made products that became obsolete in the fast-changing technology of the times. These factors dealt a fatal blow to Walker’s dreams, and he soon lost interest in St. Louis Park.